Note: These pictures were submitted by a subscriber. We do not know who wrote the comments… they know old cars. Must bring back memories for the “old folks”. I observe the cars of the day- Morris Minor, Austin Cambridge, Morris Oxford, Hillman Minx. 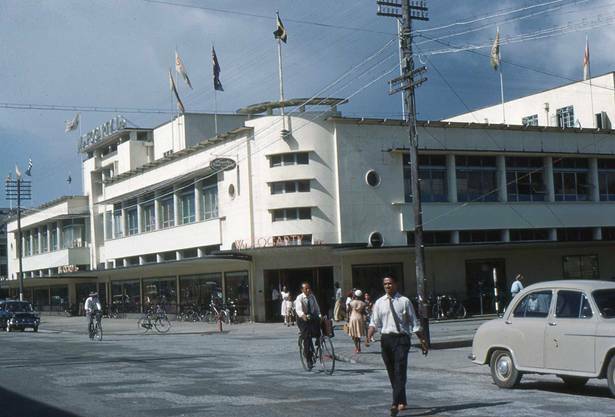 I note the Bookers Sports Dept Store to the left and opposite it…….Bettencourt’s. 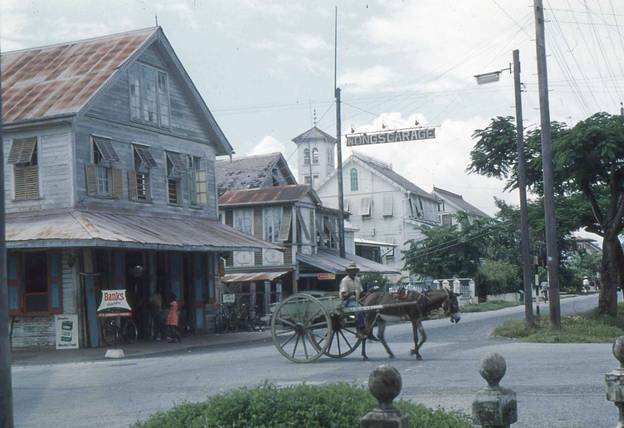 Stabroek Market’s clock tower in the background. To the left of the picture, the north eastern section of the Marine Wing of the British Guiana Police Force building is barely visible. Note the prominence of the bicycle which is in stark contrast to the present day vehicular congestion which is a feature of life around that Fogarty’s, Robb and Water Street junction. I think the shirt and tie are back now. Wow! A carrier bike on which grocery and baker shop bread deliveries were made..wow! A suspended street lamp hanging in the centre of the Camp and Regent Street intersection, no longer a feature of the landscape of the city. 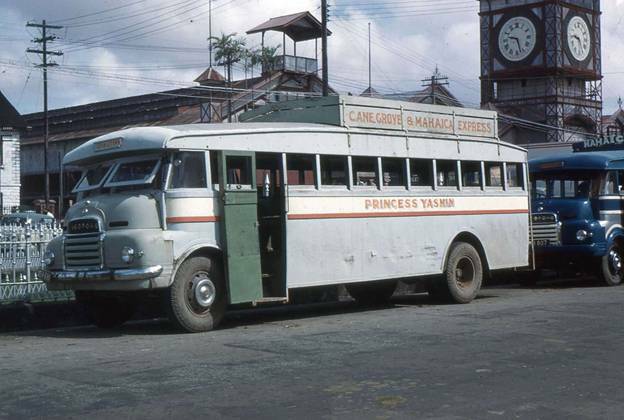 I detect a Bedford van and the back of a Vauxhall Cresta car- for which Central Garage on High Street was the sole distributor. The Vauxhall is in the intersection on the amber light. I wonder if he got a ticket from the traffic camera. 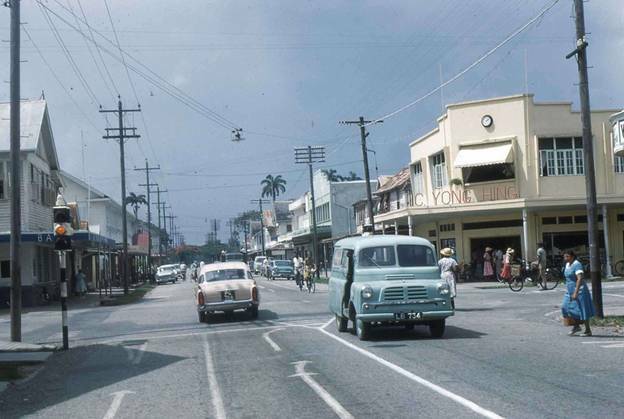 HC 300- a Ford Zephyr car (or Zodiac-can’t be sure) being driven south along Water Street, west of the Legislative or National Assembly (now Parliament Building). The Fords were sold by Geddes Grant on Main Street..that was where the Courts store now is. When I looked up to the top right section of the picture, I see a fluorescent type street light fitting (as opposed to the incandescent bulbs) that was a peculiar feature of the street lighting along Camp Street in those days. There was then no enclosure of the lawn west of the museum. 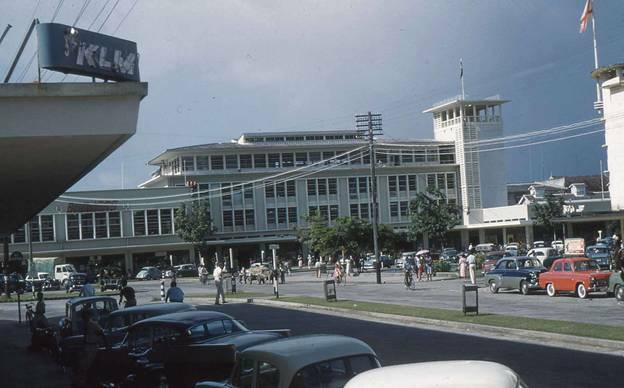 note the KLM (Dutch airline) sign in the upper left side of picture on what was then the Sandbach Parker building. 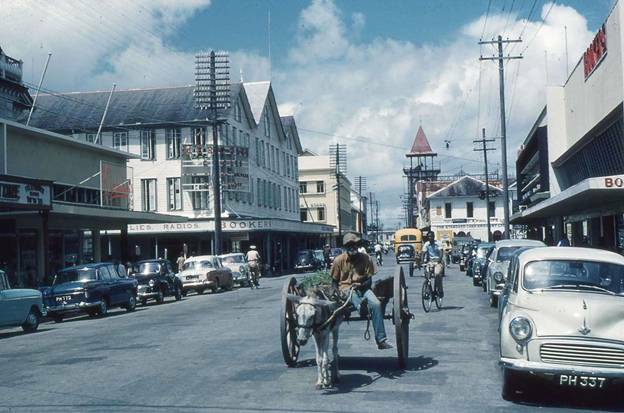 Lovely old pictures of Georgetown. 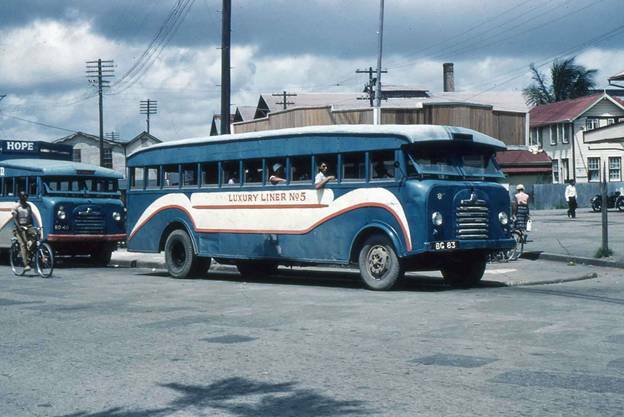 the good old days i remember as a kid – thanks for the preserver of these pictures. There are so many changes since then….now there are streets jam-packed with vehicles…buildings striving to be referred to as skyscrapers….and many, many mounds of garbage trying to be as tall as Mount Roraima. It is amazing how clean the city was then in comparison to today. WOW the memories these pictures brought back is simply amazing, comparing to the recent flicks I had seen, its amazing how beautiful and clean it was WOW!!! 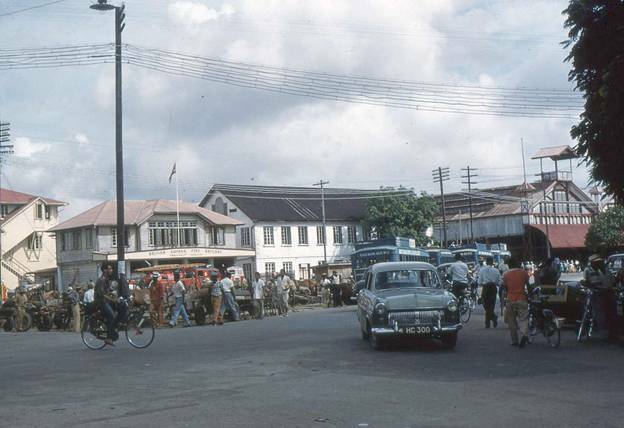 Here are some even older photographs of Guyana.